There are many places I enjoy eating breakfast in Norwich, my favourites all displaying a recommended sticker. Sometimes though other things in life need to be highly recommended and The Owl Sanctuary is a good example of this! You all know I enjoy a decent fry up but when the sun goes down I also enjoy a few drinks and seeing a good live band. By January 2014 there seemed to be nowhere decent in Norwich to do both of these things, the places I had been frequenting were rapidly going downhill. Then in February 2014 an exciting piece of news flashed up on my facebook news feed, a new pub and music venue The Owl Sanctuary would be opening in Norwich! I drove past each day on my way home from work watching it slowly transform from what had previously been The Marquee into The Owl Sanctuary. By the end of April the doors opened for the first time, never had this place looked so good! Inside it has a clean, fresh look with vibrant colours, a varied jukebox and even a Metallica Pinball machine. The long, well stocked bar certainly helps me enjoy my evening, there is a good selection of bar snacks too. These are all tasty (Spicy Bikers are my favourite) and an excellent price too so more money for Vodka! 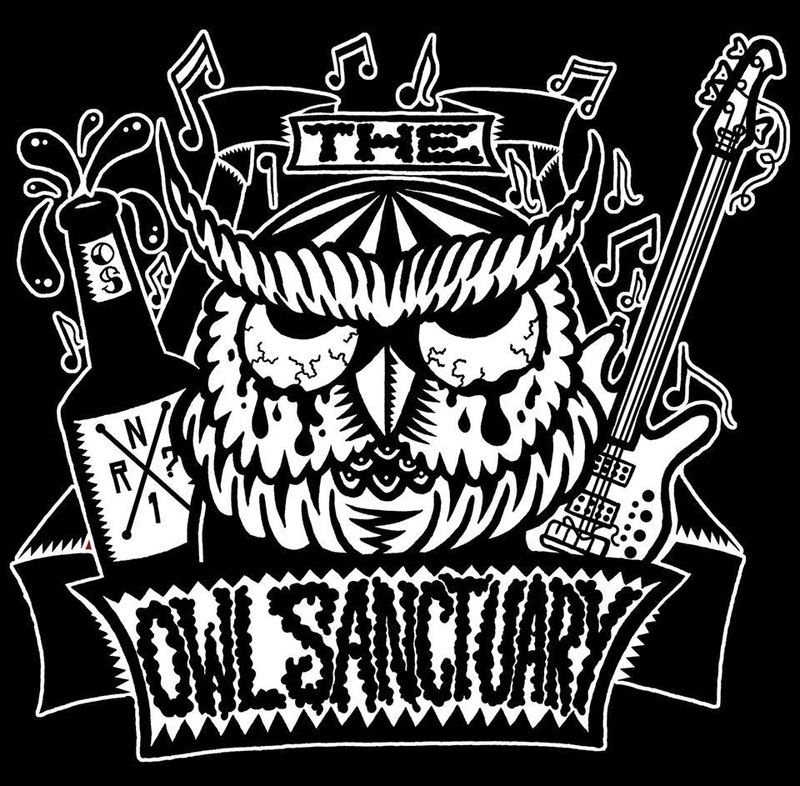 Since opening, an excellent line up of bands have played at The Owl Sanctuary. Dan Hawcroft the manager has lots of experience in the music industry. He was a roadie for 16 years with bands like Motorhead, Biffy Clyro, Biffy Clyro, Subways, Capdown, Hell is for Heroes and Hundred Reasons, so rest assured he will put on some amazing bands. I recently enjoyed seeing Canadian Psychobilly band The Brains, the band were happy to neck a few Sambuca's at the bar after the show with us, a great night! More recently I saw Agnostic Front, another amazing night and a rare treat to see them in a venue this size. If you just fancy relaxing on the sofa's with a tea or coffee this is an option too, hot drinks cost just £1! Dan, Sarah and their team of staff have certainly made Norwich an even better place now we have The Owl Sanctuary, I highly recommend it! The River Garden is just over a mile away from Norwich Train Station along Yarmouth Road. We walked there, this was a good plan as we built up an appetite on the way and needed some exercise on the way back! This breakfast is only available for 2 hours at weekends. Inside the River Garden is really nice, this area tempted us to sit down but we would be needing a table. This looked like a good place to sit, the sun was shining though so we looked for the garden. The garden here is really nice with plenty of places to sit. We sat right beside the river, a beautiful setting to enjoy breakfast! Don't worry, I didn't give the sausage to the swan! Just showing you how close the river actually was to where we were sitting. A decent breakfast menu with a good vegetarian option. I had built up an appetite so decided on the biggest breakfast on the menu. The menu did contain some errors though, you will get toast with all breakfasts and an egg with the veggie breakfast. The Stokes ketchup was amazing. Cutlery arrived next wrapped in a serviette. A decent cappuccino and sugar lumps. A selection of brown and white toast arrived on a chopping board served with real butter. A good idea as this allowed plenty of space to spread the butter on. The big breakfast looked impressive when it arrived. A pair of delicious Norfolk sausages and four slices of bacon, good job I was hungry! Golden and crispy fried bread, nicely reduced beans and tomatoes that tasted amazing! Could things get any better? Yes they could! The mushrooms were excellent and the hash brown was homemade. The homemade hash brown was the best I have ever tasted, it was cheesy too resulting in something very special that your taste buds will thank you for. A nice pair of eggs completed this stunning line up. Egg yolk seeping into the fried bread, this is what breakfast is all about! One of the best breakfasts I have ever eaten, loved it! There is a vast choice of food available on Norwich Market, the all day breakfast found at Charlie's was the reason for my visit. Charlie's is located on row C, fairly close to the back. This was to be my first fry up inspection where I would be standing. This area is ideal for tea and a bacon roll, for a breakfast on a plate it was fairly tricky though. Never had the plate been so far away before! I was a customer so no charge to me! A hot drink and slice of bread came with the all day breakfast. The coffee was Douwe Egberts continental instant, with it's nice frothy head I was happy enough! A soft fluffy white slice of bread with a thick scraping of margarine. The all day breakfast cost £5 and came on a proper plate. I often complain of tomatoes having no taste, these ones tasted great, they were barely warm though. I must be honest and say the eggs didn't really blow me away, they were cooked on a griddle though so I guess flipping was the only option. I had my fingers crossed that the yolks would be nice and runny. If you like your bacon overcooked and tough as old boots this place is for you. The sausages are cut in half and split before hitting the griddle. So much for crossing my fingers, the yolks were solid.. I have so many memories of Norwich Market since moving to Norwich in 1987. I recall drinking cider with Norwich Punks nearby at the taxi rank and walking through the market quite drunk to use the toilets. There was a chap (maybe still there) called Andy on the Leather stall on the back row, he would take photos of the Punks and Psychobilly's and sell them as greeting cards for £1. For nearly two decades Norwich Market provided me with discount tobacco, fish food and cheap suitcases. I used to eat cod and chips each week from the chippy in the centre, if I didn't have much money I would go for a pie and mushy peas on the pea stall. I only ever really visit the Market these days to buy an occasional whippy ice cream with a flake. Something recently was calling me back and making me curious though. Back in April I received an email informing me that Charlie's on Row C were serving the best fry up in the city. Having eaten so many of Norwich's finest breakfasts (found here) I had serious doubts about this claim but decided to visit Charlie's to see what all the fuss was about..
A Full English Breakfast is available to westbound traffic at Eat In on the M3, thankfully a connecting walkway ensures people heading eastbound don't miss out either. Everything is cooked already so grab a tray and join the end of the queue. A single portion of sauce (usually 20p) is offered free with every breakfast, I could hardly contain my excitement. My wife headed off to Subway as soon as she spotted no vegetarian breakfast on offer. Because there was a constant queue of people wanting breakfast the food wasn't sitting too long under the hot lamps before making it onto plates. The cloche was a good idea here as you wont be sitting down for some time! I waited around 5 minutes queueing for the advertised "Lovely Cuppa"
During this time I watched the heat from my breakfast slowly disappearing.. The not so lovely cup of filter coffee cost £2.15, by the time I sat down to drink it the temperature had dropped considerably. I had been looking forward to a decent cup of coffee all weekend but what I had made in my campervan each morning using powdered milk seemed better than this. With coffee and breakfast both on my tray I ended up here waiting to pay, nobody seemed to be in a hurry and the temperature of my food continued to drop.. It was still not time to eat though, a quick visit to collect cutlery, sugar etc was needed first. I lifted the cloche and was quite impressed with what lurked underneath. Presentation was looking good, temperature was a big concern and where was my hash brown? The mushrooms were really nice but the tomatoes tasted of nothing at all. The fried bread and black pudding was the highlight of this breakfast, the sausages looked quite disappointing but were enjoyable. Egg/bean juice contamination may have made many shudder, I am always happy to let the two combine though. This was my fifth visit to Boomtown Fair, it had been yet another amazing festival with a great line up of bands and mind blowingly good site layout. Early Saturday morning my wife and I were woken by the almost continual buzzing of my iphone on the dashboard of my campervan. My first thought was that moisture had damaged it causing it to vibrate, it was only when I checked the phone that I realised my article on the BBC had been published. 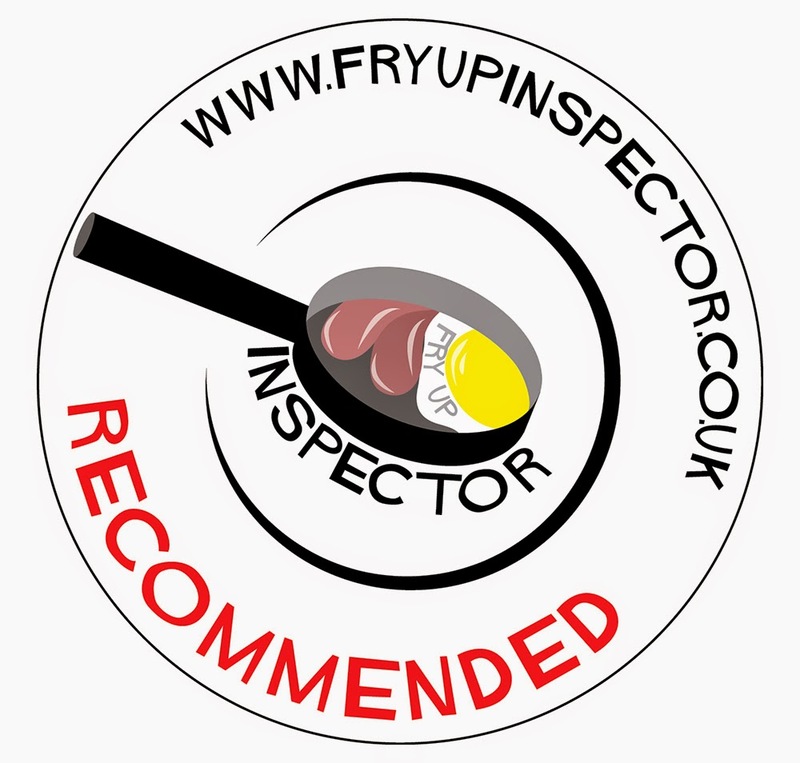 For the rest of the weekend tweets, emails and facebook notifications flooded in, in 24 hours 249,500 page views were clocked up on the Fry Up Inspector Blog! I tried my hardest with what little signal I had to reply to people but emails were coming in faster than I could reply to them so I decided to continue with Boomtown partying! On Monday morning we woke up just before 7am, whilst everyone else was still sleeping we decided to leave the site and go in search of some breakfast. Winchester Services is where we had stopped last year (read about it here) but we wanted something that was still hot so we drove on to Fleet Services on the M3..
Veggie option - Not a specific vegetarian breakfast, you could create one from the items available though.